Increase your teams ability to innovate in this unique team building experience! Every played Tetris or Pacman? Ever played as a Team? You’ve never seen Pacman played THIS way! One person controls Up, one controls Down, etc. It’s the ULTIMATE hilarious test of team communication. That’s just one of the challenges we’ll present in this unique team tech experience! We combine this style of team gameplay with a series of team tech challenges. NO TECH KNOWLEDGE NEEDED! With each challenge/game you’ll work with your team to either set a high score, build a new kind of joystick controller, or set the fastest time. 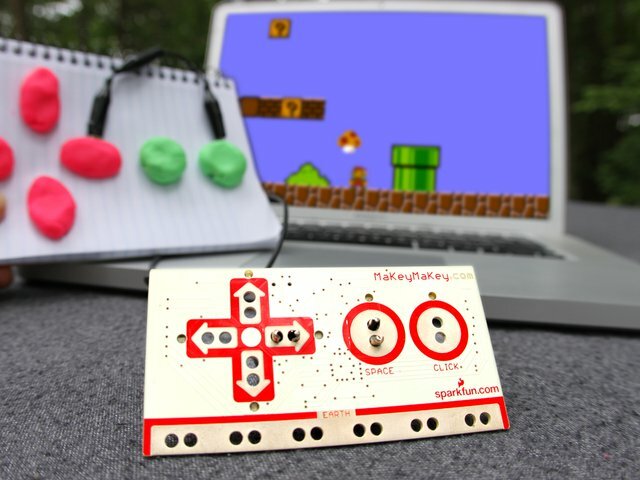 You’ll learn how to use the MakeyMakey controller so you can turn anything into a button…. Even your teammates. This is the perfect table top activity for the conference room, boardroom, or break out session. Each challenge can be paired with a new brainstorming or creativity technique like Reversing Assumptions, PictureStorming, and more. These techniques are quick easy ways to increase a team’s ability to innovate and create. Involves technology with a reason. The technology is here to encourage teamwork and collaboration. It’s not just a wow factor. We couple each challenge with a creativity technique. This activity perfectly illustrates how anyone can be creative and innovative. Innovation is the future of business, increase yours today. Professional Emcee, Onsite Coordinator, Event Staff, Team Bandanas, Medals For The Winning Team, PA System (Up To 150 People), Set-Up/Teardown, Photos Of The Day, Group Photo, Build Tools, 4 Tech/Game Challenges, Makeymakey Controllers(1 Per Team), Wires, Batteries, Jump Drive With Challenge Files, And Fun. — Requires 1 laptop per team(not provided). “Our annual All-Company Meeting was taken to a whole new level when we decided to hire James and his team from Firefly! We wanted something tailored to our group: Engineers. I had in mind Communication, Problem Solving, Learning about each other, Leadership, and Fun. James was able to accomplish ALL of these in the time period and in the budget we requested.